Svetlana Sangary’s website describes her litigation boutique in similar ways to most related practices. However, when contacted by the state bar investigating the photos (and another complaint), there was a failure to respond for many months. She refused to remove the photos in question even after contacted by the State Bar. Her 16 page response also included 148 pages of exhibits ranging from an article about Natalie Portman (now that is a photo opp I’d enjoy) to an array of e-mails and canceled checks. The judge noted her response as “bizarre”. She cited a First Amendment right to remain silent. 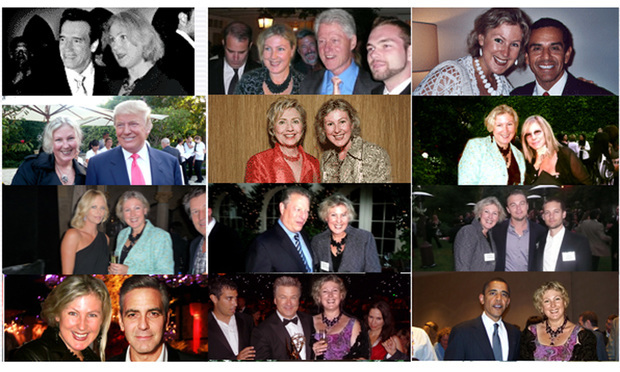 There are politicians from both parties–Obama, Biden, Gore, two Clintons and a Schwarzenegger to name a few. Hollywood elite from Streisand to Clooney; DiCaprio to Baldwin. People that annoy me like Dr. Phil and Larry King. People I’d like to hang with like Jennifer Garner and Magic Johnson (and Paris Hilton, although I would not usually admit to that one). Perhaps more entertaining are some of the Yelp reviews I read in looking to learn more about this attorney. Her 6.1 on Avvo will likely take a hit, since that included a 5/5 for professional conduct. My guess is that someone is vetting each accolade, testimonial and result posted for her in various places online. It was probably close to a decade ago that an attorney came up to me after one of my internet marketing ethics programs for the Pennsylvania Bar Institute in Philadelphia. He was somewhat irate (and annoyed) by a Philadelphia lawyer that displayed a “photo gallery” on his website of him with various politicians and celebrities. He believed that the use of such photos were deceptive and misleading–suggesting to potential clients that he had relationships with these folks and potentially might be suggesting they are clients. Now this CLE audience member actually expected me to “do something about it.” I still remember responding that I was not the ethics police and that he was free to report this website to the state bar. I don’t know if he ever did. But I did start using that website as an example in my seminars of a “potential issue.” Just minutes ago, I went back online to see if that photo gallery was still a part of the law firm website in 2014–and sure enough, it was. In a twist of irony, many of the politicians and celebs in those photos are the exact same people photoshopped in Ms. Sangary’s gallery–although I do believe his to be authentic. You might ask me why I don’t “name names” in this example (as I often do). Well, I’m still not the ethics police. And while I don’t know the guy personally, he seems like a good person and is involved in some related organizations outside of the legal profession that I’m also in. So, I’d rather just be nice about it (this time). However, I’ve always suggested in my CLEs that a proper disclaimer in regard to the photo gallery and his relationships might go a long way to appeasing anyone believing the use to be deceptive and misleading advertising. And I might suggest that these two photo gallery examples–from Philadelphia and Los Angeles–will likely make it into my 2015 ethics CLE. The marketer side of me finds both examples to be entertaining. Although I doubt she can fall back on the “no such thing as bad publicity” argument in this situation. The ethics attorney side of me wonders if the deceptive and misleading argument would still be an issue if indeed those photos were real. Perhaps that is a case of first impression somewhere else for another day. For Ms. Sangary, the bar court judge also recommended a three year probationary period to go with the six month suspension, and a retaking of a professional responsibility exam. Only in Hollywood.